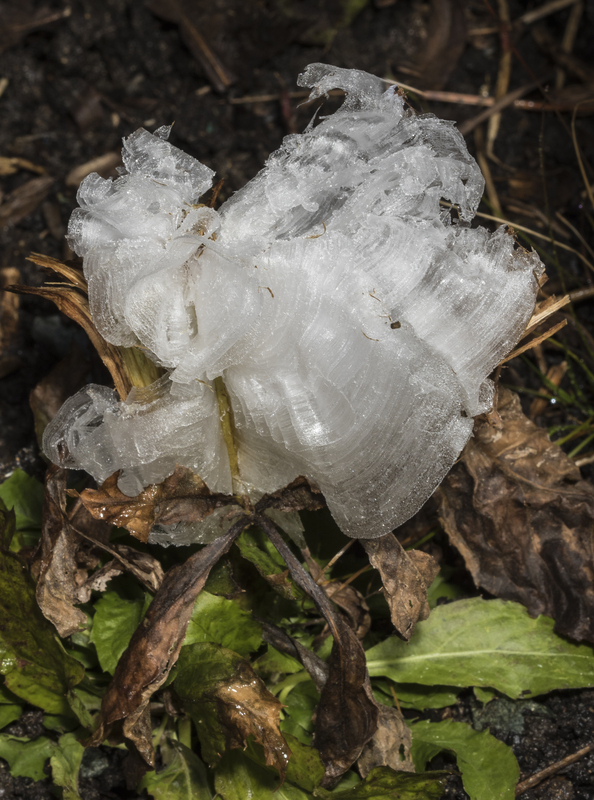 This entry was posted in Nature Photography and tagged frost, ice flowers, NC Botanical Garden by roadsendnaturalist. Bookmark the permalink. Hi Elizabeth I thought of you and your interest in botany, etc. when I read this post. The writer sends these posts a couple of times a week. He’s the naturalist who took John and me on an exploratory full day’s nature excursion to the coast last winter…..saw all sorts of birds (snow geese, swans, ducks), bear, etc. He’s a super photographer as well as experienced naturalist. He leads private nature excursions (local and afar) and also works for the Museum of Natural Sciences (I think). Anyway, I thought you might find this interesting. 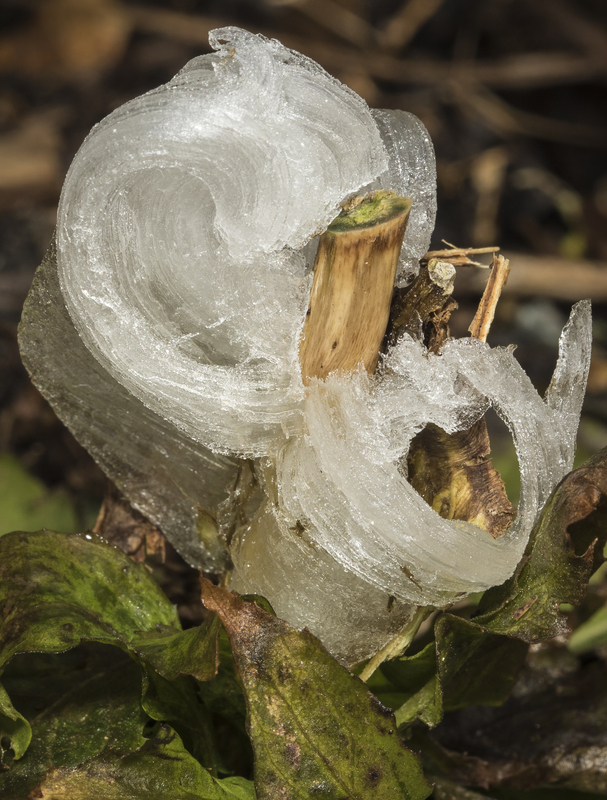 See you Thursday…..maybe we’ll see a frost flower, but I’d vote for a bit warmer weather! Thanks for the kind words, Linda. I am now working at the NC Botanical Garden in Chapel Hill and that is where I found these beautiful ice flowers. Never too old to learn something new. I’ve never heard of nor seen this phenomena before. Your blog is always educational and interesting! Thanks, Mary Kay. I agree, always something new out there…thank goodness for the internet. Wonderful, Mike! I don’t remember ever seeing one of these. Thanks tremendously for sharing this. 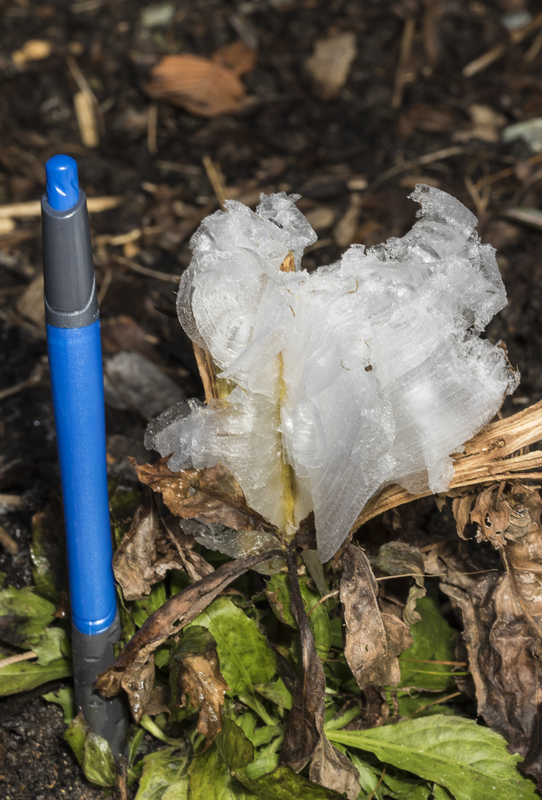 I had no idea these ice flowers existed…wonderful and so beautiful! Thanks, Mary. I had heard of then but never seen one until last week. Strange and beautiful.